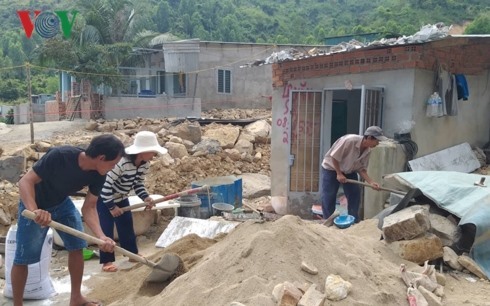 NHA TRANG CITY — Local people whose houses were destroyed by landslides in the city of Nha Trang’s Phước Đồng Commune, the central coastal province of Khánh Hòa, have re-built their homes despite warnings by authorities, reported online newspaper vov.vn. The people said they understood the danger but did not have any choice but to come back because local authorities had not offered any resettlements solutions since the houses were destroyed late last year. More than 140 houses in Phước Đồng Commune collapsed due to heavy rain and landslides in November. People had to move out of the area and rented houses in neighbouring communes for several months. But, according to the paper, the accommodations were uncomfortable and people could not afford the high rent. On average, a 20sq.m room costs about VNĐ1.5 million (US$65) per month, but their incomes from fishing were not stable. For years, people in the commune had illegally built houses on the mountainside. After the landslides, Nha Trang authorities gave each household VNĐ4.5 million ($200) to move out and agree not to come back. But only 39 households received the money. The local authority has not yet found a solution. “At present, the local authority has faced difficulties in dismantling the illegally rebuilt houses,” said Bùi Cao Pháp, the commune’s vice chairman.